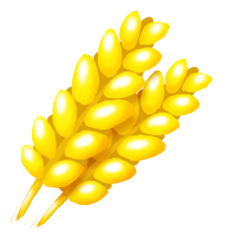 Wheat is a field crop unlocked at level 1. It is the very first crop unlocked in the game and by far the one which is used to make the most different products. Due to its short production time, wheat is often used to farm experience points or get supplies. Like all crops it is stored in the silo. Wheat grows in fields by planting another wheat plant (either previously harvested or purchased). Each plot yields 2 plants (net gain of 1 plant) and 1 experience point, and takes 2 minutes to mature. Wheat can be sold or bought for a maximum price of 36 coins for 10 units. Boat orders ask for 50 to 88 wheat per crate. Wheat is so common that selling it at high prices may result in fewer or slower sales. Wheat can be sold to visitors at 28 coins for each 10 units. Harvesting wheat gains you the most experience points and supplies per minute. Continuously harvesting wheat is often called “wheating”.